Scientific Games Corporation (NASDAQ: SGMS) (“Scientific Games” or the “Company”) today congratulated its longtime customer, the Delaware Lottery, the first U.S. lottery to expand to full-scale sports betting following the U.S. Supreme Court’s ruling on the Professional and Amateur Sports Protection Act (PASPA) of 1992 on May 14, 2018. 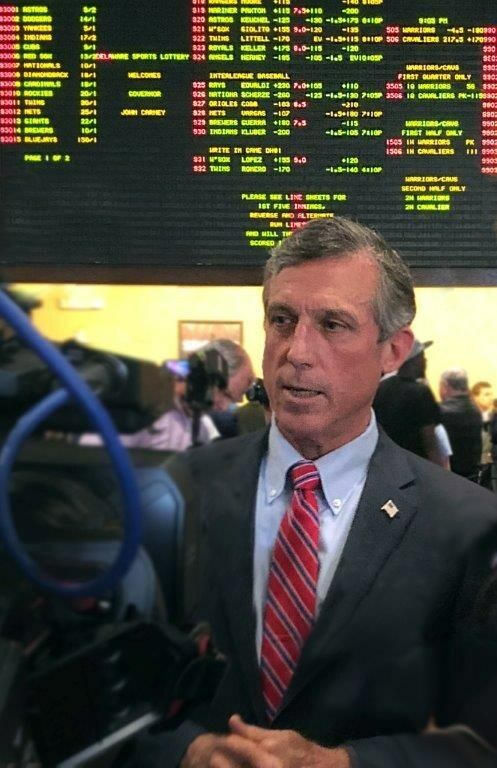 Delaware’s Governor Carney purchased the first sports wager on Tuesday at Dover Downs Race and Sports Book. “In anticipation of the Supreme Court’s ruling on PASPA, we have been working with our long time sports providers Scientific Games and William Hill, as well as training our lottery and casino staff, so that we were ready to launch full-scale, head-to-head betting on single games,” said Vernon Kirk, director of the Delaware Lottery. Delaware is the first U.S. state to add full-scale sports betting after the PASPA ruling. The state previously offered legal sports betting on professional football and has now expanded its offering to other sports. Since 2009, Scientific Games has managed an integrated sports betting program through Delaware Lottery retailers and casino sports books, working with William Hill, a leading global sports book operator for sports risk management services, and Stadium Technology Group, which provides the sports software used to take wagers in Delaware. The program has grown the Delaware Lottery’s sports betting revenues from $10 million to more than $46 million across a network of land-based casinos and lottery retailers in the state. “As Delaware is known as ‘The First State’, it’s appropriate they were first in the nation to expand regulated sports betting after the PASPA ruling. We are proud to support the Delaware Lottery’s long history of industry firsts, and thrilled to be their trusted provider of an integrated sports betting program serving both casinos and lottery retailers across the state,” said Pat McHugh, Senior Vice President, Global Lottery Systems for Scientific Games.